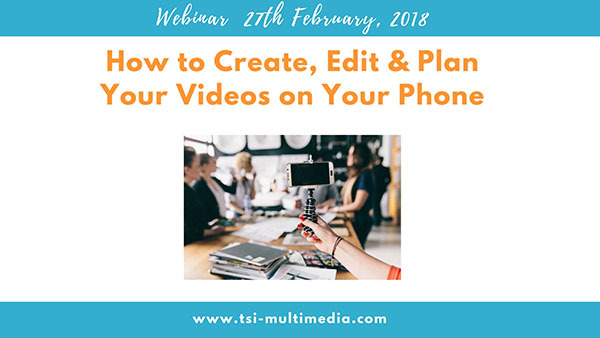 Last week I held my first DIY Video webinar called 'How to Create, Edit and Plan Your Videos on Your Phone'. It was a great success and I was happy with the feedback about the content. Going through the exercise of getting people to register was really worthwhile because through asking one simple question, I found out what you really wanted to know when it comes to learning video, and what stops people. And it allowed me to deliver the right content. So from this week I want to start delving deeper into STARTING IN VIDEO. Because it seems that is the place where the majority of small business owners get stuck. And it's not from lack of ability or lack of not having the gear. Shooting video on a phone doesn't require a lot of skilled ability. Most of us have done it to different levels, and mostly in a social capacity. We just have to use those same skills and enthusiasm and transfer them across to our business. And as far as having the right gear, as I explained to my webinar participants, you don't need very much at all. "So where are people getting stalled? OVERWHELM"
Why? Because if you think about what it takes to create a video, from start to finish, there are lots of moving parts and many pieces to the puzzle. There are also an overwhelming number of options. So it can become confusing as to where to start. In the webinar we began with IDEAS FORMATION as a place to start. Because before you even pick up your phone to start videoing, you have to know what you want to video. You have to ask yourself "why do I want use video? ", and "what do I want to do with it?" (if you'd like to access the recording of the webinar, CLICK HERE to enter your details and you'll be taken straight to the video recording). So here are two questions and places to begin. And take the time to answer them as thoroughly as you can. Your answers will influence your ability to attract the right customers and audience when it comes to creating your videos. I've taken these directly from my webinar slides and notes. 2. KNOW WHO YOUR TARGET MARKET IS. What are they interested in? Most businesses should know who their customers are. If you don't, then take the time before you do anything else, and get to know who your customer is, and who wants and needs your products and/or services. How do you know how to market or how to package what you do if you don't know who you are selling to? And more importantly, what is the message you are sending to your customers if you don't know what they like or want, where they hang out on social media, what interests them, and what you can give them that your competitors can't? Just in answering these two questions, you can begin to work out what content is going to appeal to your customers to then help you begin developing a video marketing strategy. So if you are one of those business owners who is confused about where to start, then start right here and answer those questions as well as you can and in as much detail as you can. And don't worry about getting it perfect. Just start somewhere, with the understanding and acceptance that you will make mistakes and you won't get it perfect the first time, or even the second time. In fact, perfection is rarely achieved. But in order to experience success in getting video to work for you, all that's required is a little planning and imperfect action! Next week, I'll talk about another big challenge that can stop business owners before they've started - stepping in front of the camera. And I'll share some tips to help you reduce the fear.